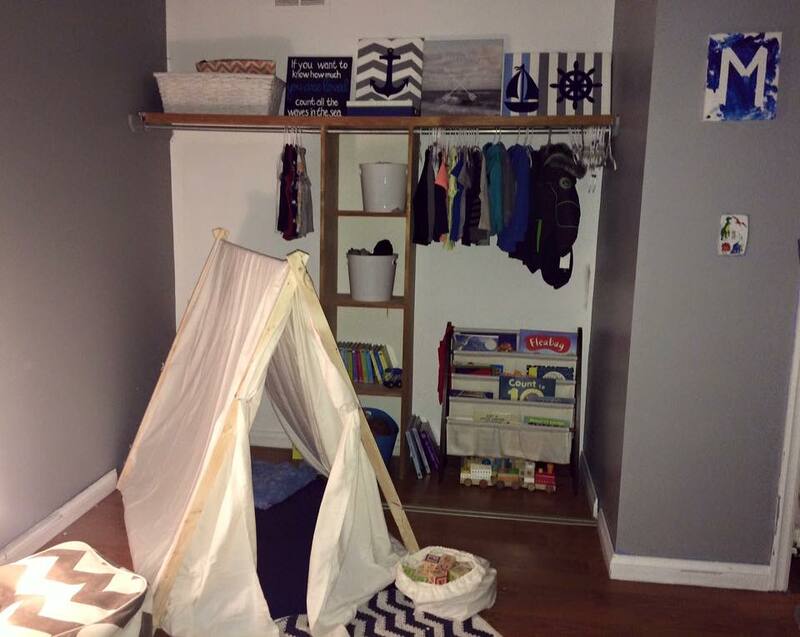 I wanted to share some tips on decorating a toddler's/child's room on a budget. Think of a theme a few months in advance. We knew we wanted to re-decorate Mason's room for Christmas, so I've been researching themes, ideas and decor literally for months. The theme started out as a nautical theme (of course), then switched to camping, then when I couldn't find any camping ideas, it turned into this travel/outdoors theme. 2- Once you have a theme, create a Pinterest board and pin everything that catches your eye, or products that you find interesting. This was a really useful tool for me because it helped keep my thoughts organized, and I referred to it often when looking for fun decor ideas. You don't have to buy expensive items that you pin, but it's a nice reference for finding cheaper alternatives. 3- Don't buy everything at once. This is the biggest way that we budgeted our money. Every pay cheque I would pick up a couple of items for his room, and store it in our spare room until I was ready to decorate. 4- Scan Kijiji or yard sale sites often for furniture that you can refinish. Mason's dresser was a project that I did last year, and we continue to use it in his new room. It started as an old solid wood dresser with brown paint, and I gave it a fresh coat of white and new hardware (from the dollar store) to give it a completely new look. 5- Speaking of the dollar store- check it out! You honestly never know what you're going to find there. Also check out Walmart, Target (for my American friends) , ect for any decor that you can use. Also shop local! I have found some amazing deals from local small business owners. I'm going to post some of the items that I bought for Mason's room, along with where I bought them and how much they were. This blanket was a gift from one of my mother's co-workers! We used it in Mason's crib and it also happened to coordinate perfectly with his new room. Using item's that you already have is an awesome way to save money. Even if he outgrows using it as a blanket, it looks great folded over the back of the bed. This toy box was made by a local mom and her husband! We ordered it last Christmas as a gift for Mason, and we are still in love with it. She was just starting her business and only charged $30 at the time! Looking around for local companies that are just starting out, or looking to make some extra money for the holiday's is a great way to save money on decor, and support local businesses. I LOVE these white buckets from the Dollarama. We keep 90% of Mason's clothes in his closet, and these buckets are perfect for putting clothes away quickly. One is for pants, and one is for PJs. I roll the clothes so they fit neatly, and that's it :). They only cost about $1-$3 each. Another bucket that I love. This one is from Walmart and was around $6. We use it as Mason's clothes hamper. I love it because no matter how full it is, the handles close together so I can carry it with one hand. This "M" painting was created by Mason himself. Kids love seeing their own art displayed. I plan on framing some of his other projects and swapping them out every so often for new work. You can buy canvases and paint at the Dollarama, and let them go crazy with it. I taped off the "M" in this case and he finger painted around it. I love this fun stool/cushion. Mason loves climbing up on it, and it went nicely with the other items in his room. I actually bought this from a local yard sale site! A mom was using it in her kids play room and they did not use it, so she sold it for $10! It was clean and barely used, and such a good deal. The play tent! My favorite feature of his room, and another local purchase! I had the wooden frame custom made by the local company "Phoenix Timber". I sent her a photo of what I was looking for, and she emailed me back saying they would love to do it! The frame was only $40, and I made the fabric part from a new flannel sheet that I had at home. The tent is collapsible and can easily be folded up if we ever need more floor space to play. The bed! This was the only real splurge, and it was a gift from my dad and step-mom for Christmas. It's from Leon's, and they delivered it and set it up for us, which was awesome. The bedding is an $18 comforter from Walmart. It's hard to tell from the photo, but its a grey and white pattern. The sheets were just a $20 sheet set from Walmart. I searched for months for the perfect bedding set and couldn't find exactly what I wanted, so we bought this for now, and it worked out well with the rest of the room. The art work! The "Wanderlust" picture and the one hanging over his bed are both from Winners and were only $12.99 each. I thought they went well with the travel theme. The other paintings were actually done by my cousin Amber for my baby shower when I was pregnant! I love them and they still go with the rest of the room, so I wanted them displayed as well. You can paint your own paintings to go with whatever room theme you choose to save money on buying art. Mason loves his blocks, so I wanted to find a nice bag to put them in, rather than have them loose in the toy box. I actually ended up using the bag that the sheets came in for his play tent. Its the same fabric as his tent, and looks cute sitting beside it. Paint!! I knew I wanted a neutral color that he can grow with. Neutral paint makes it easy to change decor whenever he wants a new theme. My friend Emily actually had a spare can of paint from a project that she did, and sold it to me for $20! If you check Kijiji, you can usually find other people doing the same with left over paint. You can also check stores for "mis tints" or paint that someone requested but didn't buy. The color that I used is a CIL paint called "West Coast Grey". I bought all of my painting supplies at the Dollarama. Tip: if you do this, make sure you buy an extra roller. I ended up having to duct tape mine half way through when it snapped in half haha.